Mindfulness-Based Cognitive Therapy (MBCT) is an evidence-based program that combines mindfulness and cognitive therapy techniques for working with stress, anxiety, depression, and other problems. 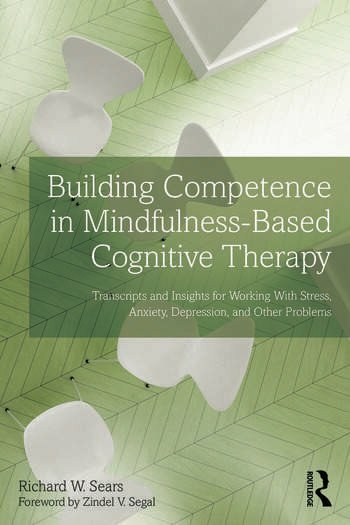 Building Competence in Mindfulness-Based Cognitive Therapy provides the first transcript of an entire 8-week program. This intimate portrayal of the challenges and celebrations of actual clients give the reader an inside look at the processes that occur within these groups. The author also provides insights and practical suggestions for building personal and professional competence in delivering the MBCT protocol. Richard W. Sears, PsyD, MBA, ABPP, is clinical/research faculty at the University of Cincinnati Center for Integrative Health & Wellness, volunteer associate professor of clinical psychiatry and behavioral neurosciences with the UC College of Medicine, and a psychologist contractor at the Alliance Institute for Integrative Medicine. He regularly conducts MBCT groups at the Alliance Institute for Integrative Medicine.